Thanksgiving should be spent enjoying time with family and friends, not worrying about a plumbing emergency. But don’t worry. Whether you’re a guest or a host this Thanksgiving, we’ll share how you can prevent each of these problems. A clogged toilet is one of the most common (and embarrassing) plumbing issues that pop up during the holidays. So we’ll share some tips on how you can avoid it. Remove items that shouldn’t be flushed down the toilet (wet wipes, tissues, paper towels, etc.) from view and place a trash receptacle near the toilet. Only toilet paper should be flushed down the toilet. Leave out a plunger for your guests to use in the event of a toilet clog. If your plunger is old and cracked, consider investing in a new one. Consider using single-ply or thin toilet paper to avoid clogs. Unfortunately, young guests can be overzealous when it comes to the amount of toilet paper they really need. Thin paper can help prevent clogs in these cases. Make sure your toilets are running in good condition. Have a running toilet? Or does it make a strange sound when you flush it? You should contact a plumber to fix whatever is causing the issue so you don’t put your guests in an uncomfortable situation. Be considerate about how much toilet paper you use (don’t fill the bowl with toilet paper all at once). And don’t flush anything down the toilet except toilet paper. Do a “courtesy flush” as you go to reduce odors and the risk of a clogged toilet. DO NOT FLUSH the toilet again. This will only make the water rise and the problem worse. 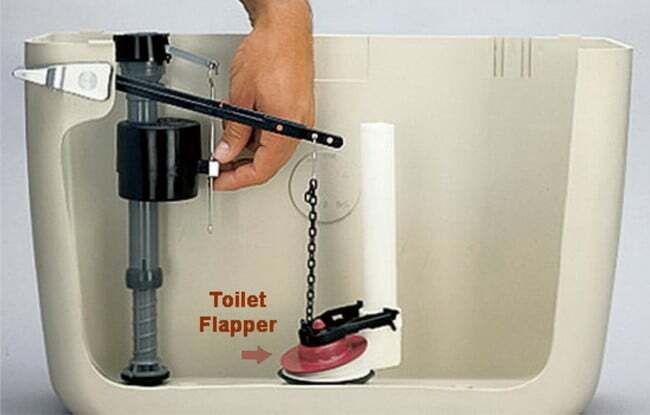 If the water won’t stop running, remove the toilet tank lid and make sure the toilet flapper is tightly creating a seal so water will stop entering the bowl. Take a plunger and gently and firmly push up and down to remove the clog. If the toilet is still clogged, alert the host ASAP so that they can contact a plumber. Whether you’re in charge of preparing Thanksgiving dinner or you’re just looking to impress the in-laws by taking dish duty, it’s important to know how to properly use the garbage disposal. Does the sink smell bad? Deodorize your garbage disposal by grinding up ice cubes and lemon or lime wedges. Hosting guests over Thanksgiving? That means more people taking showers, more dishes to wash and maybe even more laundry. An easy way to prepare for the increased hot water usage is to lower your water heater’s thermostat to 120° degrees. Here’s why: Lowering your hot water temperature to 120° (most homes have it set to 140°) means you home’s available hot water will stretch further, which means you can do more hot water activities in the same amount of time. Follow this step-by-step tutorial on how to adjust the thermostat on gas or electric water heaters. Now, if that doesn’t fix your hot water running out too fast, read our related article, “Why Is My Water Heater Running Out of Hot Water Faster Than Normal?” to troubleshoot the issue further. Need help from a Minneapolis plumber? We’re happy to be of service. Drop us a line or give us a call to schedule an appointment with one of our trusted plumbers. We’ll fix whatever plumbing problem you have quickly so your home can get back to normal again.